Leptospirosis is caused by a spiral-shaped bacteria called Leptospira. Veterinarians can usually identify leptospirosis in a patient even before laboratory tests confirm a diagnosis because of the infection's distinctive symptoms in California sea lions, which include drinking water and folding the flippers over the abdomen. Since 2009, the Center's biologists and veterinary staff have taken blood and urine samples from wild juvenile California sea lions at popular haul-out spots in the San Francisco and Monterey Bay areas. These animals are then tagged and released, and the urine and blood samples help researchers learn more about kidney function and exposure rates among these animals. 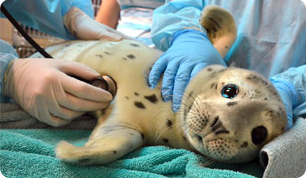 Report sick marine mammals to The Marine Mammal Center by calling our 24-hour hotline at 415-289-SEAL(7325). Maintain a safe distance of at least 50 feet and keep dogs away. Support this life-saving work by making a gift today. Prager, K.C., Alt, D. P., Buhnerkempe, M.G., Greig, D.J., Galloway, R.L., Wu, Q., Gulland, F.M.D., Lloyd-Smith, J.O. 2015. Antibiotic efficacy in eliminating leptospiruria in California sea lions (Zalophus californianus) stranding with leptospirosis. Aquatic Mammals 41(2): 203-212. Prager, K.C., Greig, D.J., Alt, D.P., Galloway, R.L., Hornsby, R.L., Palmer, L.J., Soper, J., Wu, Q., Zuerner, R.L., Gulland, F.M.D., Lloyd-Smith, J.O. 2013. Asymptomatic and chronic carriage of Leptospira interrogans serovar Pomona in California sea lions (Zalophus californianus). 164 (2013): 177-183. Zuerner, R.L, Cameron, C.E., Raverty, S., Robinson, J., Colegrove, K.M., Norman, S.A., Lambourn, D., Jefferies, S., Alt, D.P. and Gulland, F. 2009. Geographical dissemination of Leptospiria interrogans serovar Pomona during seasonal migration of California sea lions. Veterinary Microbiology. 137: 105-110. Cameron, C.E., Zuerner, R.L., Raverty, S., Colegrove, K.M., Norman, S.A., Lambourn, D.M., Jeffries, S.J., and Gulland, F.M. 2008. Detection of pathogenic Leptospira bacteria in pinniped populations via PCR and identification of a source of transmission for zoonotic leptospirosis in the marine environment. Journal of Clinical Microbiology, 46(5): 1728-1733. Norman, S.A., DiGiacomo, R.F., Gulland, F.M.D., Meschke, J.S., and Lowry, M.S. 2008. Risk factors for an outbreak of leptospirosis in California sea lions (Zalophus californianus) in California, 2004. Journal of Wildlife Diseases, 44(4): 837-844. Lloyd-Smith, J.O., Greig, D.J., Hietala, S., Ghneim, G.S., Palmer, L., St. Leger, J., Grenfell, B.T., and Gulland, F.M.D. 2007. Cyclical changes in seroprevalence of leptospirosis in California sea lions: endemic and epidemic disease in one host species? BioMed Central Infectious Disease 7: 125.